Grace vs. Grind: Which One Are You Operating in? That good ol’ hustle everyone seems to be on. We’re all out here pushing, striving, grinding, trying to succeed. Staying on the grind is how you make things happen. The grind is the place where dreams come true. The other day, I was at Whole Foods looking for a pack of ground turkey (it was taco night) and because I’m one of those lovely all-natural-certified-organic-grass-fed-free-range-non-GMO people (except, of course, when I’m not), I walked passed the pre-packaged meat and opted to order from the butcher counter. After choosing my bird, Mr. Whole Foods Butcher Man proceeded to place my hormone-free, pasture raised turkey in the grinder. And as I stood on the other side of the counter, strangely transfixed as I watched this very routine process go down, I had an uneasy realization. Outside of the world of pithy Instagram quotes (also known as “in real life”), things that meet “the grind”…tend to get ground up. Now I’m no turkey, but my experience with “the grind” hasn’t fared much better. The only problem is, like that poor turkey (the tacos were great though!) it’s been a struggle not to get ground up in the process. I first shared my frustration with this in my post “Got Systems? 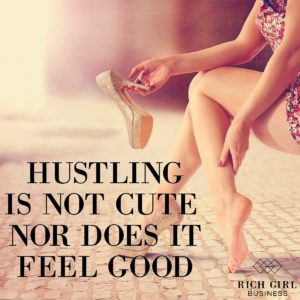 How to Hustle Hard Without Giving Up Your Life” I was tired of sacrificing myself to the alter of The Grind, doing whatever it took to move my goals forward without stopping to take care of me. So what was a girl to do? I did what every ex-Engineering major would do, duh. I built me some systems! With my elaborate processes and checklists in hand, I felt really confident I could finally beat The Grind. My little to-do lists now included weekly manicures and shopping trips. You know, “me time.” No more would I have to worry about my self-care on the road to success. At least not until two Saturdays ago when I couldn’t get out of bed. Grind it Out or Trust Your Gut? Actually, that’s not totally true. Getting out of the bed wasn’t the problem – the work that awaited me was. You see, my normal routine is to get up early on Saturday and…well, hit the grind. Saturdays are one of the few days of the week I have to devote 100% of my time to my business stuff, so I like to get up early and get to work. On that particular Saturday, however, I couldn’t do it. I wasn’t sure what was wrong but something felt “off.” Not physically but definitely emotionally/spiritually. At first, I started to get really worried because I thought I was just procrastinating or had slipped into major self-sabotage. Nevertheless, I just decided to go with my feelings and spend the day taking it easy on myself to see what came up. As the day went on, I realized that the feeling wasn’t self-sabotage but intuition. My instincts were pointing out that something was wrong but because I was so used to “grinding” through my days everyday, I was not taking the time to stop and listen. If I had, I would have heard my inner voice say that I was going about it all wrong. Up until that point, instead of listening to that quiet, still voice, I was unwittingly following the “collective” voice. You know, that ever looming message that says you have to “hustle hard”, “grind it out”, and generally throw yourself at your goal, no matter the personal cost, if you want to succeed. Now I have no problem giving my all and working hard. And I have no problem making sacrifices. What I do have a problem with is feeling like I have nothing left for myself. That my own wellbeing doesn’t matter and if I insist on taking time for myself, I’m somehow less “committed” to my dreams. I wasn’t sure if I had “the right” answer, but as I spent time away from the blog reflecting on all this, I decided that putting myself first was what I was going to do. It made no sense to finally reach success if my relationship with myself and those I care about got ground up in the process. I wasn’t sure how I was going to achieve my goal with this new mindset but I knew I wasn’t going back to how I was doing things. I was officially giving up the grind. “My everyday goal is PEACE. I used to be the kind of entrepreneur who “hustled” and “grinded” to work my business. I thought that being a BOSS and a Go Getter was the way to reach success. I would set outlandish goals that required an absurd amount of work to accomplish. I even coined the term “Get Beasty” and taught a workshop called “Beastification Week.” But Somehow I would always find myself depleted, tired and burnt out trying to work my business. Sure… I made money. Lots of it. But because most of it was generated from a place of strain & struggle, I could never keep it. 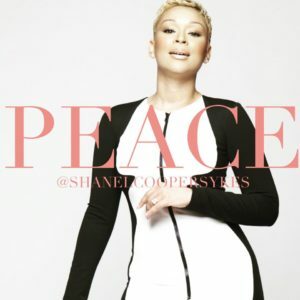 What I’ve learned along my spiritual journey and as an entrepreneur & influencer is that the goal for everything should be PEACE. God is not a God of confusion, tension or strain. He designed the universe to grow and flourish naturally with no force needed. Birds don’t struggle to fly, so why should I? The grass doesn’t worry about growing, it just grows. Naturally & effortlessly. I’ve learned that when u take a position of ease and authority and you know that you’ve been gifted with something to give to the world, and you give it from a place of service rather than hustling to get a sale – things flow to you naturally. Money appears, sales increase, people show up and opportunities that you don’t have the power to create yourself, miraculously appear. It’s called being IN FLOW & knowing your value. I realized there is nothing to “go get” because I already have it all. I just had to HONOR what God has given me so that I can then give it to other people. And yes- CHARGE for it. You should certainly reach for financial gain and to be paid for the services or products that you provide. I call it spiritual selling! God gave me this… So I can give you that… Once you have that from me… you can then go do this! KNOW YOUR VALUE, and serve it from a place of peace. Today, people pay me thousands of dollars for coaching or consulting that I don’t need to even promote on social media because clients flow naturally. Or, if I do choose to sell a product online, it sells like wildfire and changes many lives. I got here by recognizing that my gift goes beyond hustling and striving for something that I think I don’t already have. Now this does not mean don’t work! It just means work from a place of peace and confidence. You have to BELIEVE IN YOURSELF and trust that God will lead you to where you need to be for YOUR divine success. When I saw this post, I almost fell out of my chair. I felt like this was written directly for me. Shanel nailed it, and in reading her post, I saw both the problem with grinding and the solution. 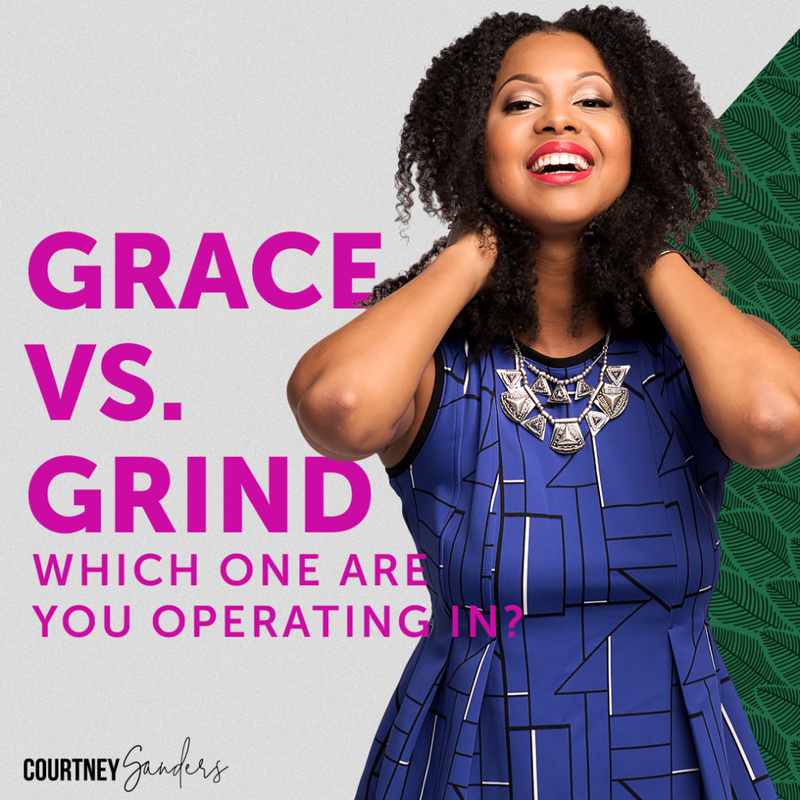 Simply put, when you are “on the grind,” you are not operating from a place of grace. Grinding is so seductive because it comes from the belief that if you throw enough sheer force at your dream – time, money, and energy – then something has to move. If you take an axe to a tree long enough, eventually it’s going to come down. The only problem is, as human beings we are limited. There is only so much time, so much money, so much willpower, and so much sheer force that we can put towards any situation. Unless you have super human strength, you can only swing the axe for so long before you get burned out. Like me, most people are too busy grinding to realize its inherent flaw. We just keep chipping away and wonder why its taking so long and requires so much effort just to get ahead. However, once you realize that you are limited and admit that there is a gap between what you need to achieve your dreams and what you can humanly do, that’s when you can exit the grind and…enter into grace. When you think about it, both definitions are saying the same thing. When you focus on operating in God’s purpose for you, there will be a certain ease, a “simple elegance or refinement of movement” that is present in all that you do. This is what it means to work in grace. Yes, you will always have to work hard at your goal but when you pursue it from a place of grace, you won’t have to strain or struggle to achieve it. I saw this firsthand when I wrote and designed my workbook. I finished it in 6 weeks flat. It was amazing. Even though I spent upwards of 5 or 6 hours A DAY on it, there was an ease and flow to it where I almost felt like the book was creating itself. When my family asked me what I was working on, I told several people on several occasions that I had no idea how I was able to do this. I am not a professional writer, nor am I a professional designer. Yet that book poured out of me at lightening speed, with an almost supernatural level of quality that I myself did not believe I was capable of producing. Looking back, I now see that I was fully IN GRACE, not grind. Producing that workbook was NOT a grind. Yes, it I put a lot of energy, effort, and HOURS into it. Yes, it was hard work. But it was not strained work. There was a “pull” to it; I didn’t have to “push” or clench my teeth and bulldoze through to achieve it. I truly believe that when you are in purpose and more importantly, you are in a grace mindset, God will fill in the gaps between your limitations and your desired outcome. This is actually promised to us as Children of God. (“And we know that in all things God works for the good of those who love him, who have been called according to his purpose.” Roman 8:28) When you grind, it becomes a hard, stressful ordeal because you are working endlessly in an attempt to bridge that gap yourself. Furthermore, grinding is dangerous because it prevents you from seeing the obvious. “I see a lot of women “hustling” to get their business off the ground. Hustling trying to figure out how to make it work. Hustling between one project to the next. Hustling to find clients. It seems that we are now encouraging and embracing the “hustling” mentally. But why? All hustling does is leave us feeling overworked, overwhelmed and like we don’t have enough time with our family and friends. I know this feeling all too well. I was hustling between a full time job, trying to get my business off the ground, being a supportive wife and mom of two very young boys. I felt like I was going to lose it. I was working hard with nothing to show for it. It can really be disheartening to be “hustling” just to still end up broke. To be honest, when I first saw this post back in February, I was kind of offended. Back then, I was in the throws of “grinding” to get my stuff off the ground, so to hear her say that hustling was a bad idea immediately put me on the offensive. Yet I always remembered that post. Now that I’ve experienced the negative consequences of grinding that she mentions – overwork, overwhelm, having no time for family and friends – I see that she was completely right. I think grinding is problematic because, more than anything else – it keeps you from asking why you have to grind in the first place. As Danielle describes above, she had to grind in the beginning because lacked the systems that automatically grew her business. Had she done what most people do – grind harder – she would have never gotten off the treadmill to find a better way. And I get it. If you’re really serious about your dream, the impulse to “grind harder” is a strong one. But now that I’m on the other side of feeling like I have to grind, I realize that most people grinding because ultimately they’re afraid. I know I was. I thought that if I didn’t keep the hustle up, I would never reach my dreams. By listening to my gut that day, I’m grateful that I “saw the light” and learned that grace, not grind, is truly the better way. Grind is not having time for your spouse/family/closest friends. Grace is receiving divine knowledge of what you should work on so you can let go of the rest. Grind is copying, comparing, and chasing after every “tip, trick, and tactic” because you’re desperate to see success right now. Grace is trusting in your own gifts and abilities because you know you are good enough to achieve the success you seek. Grind is forgoing your spiritual, emotional, and physical wellness for the sake of “giving your all” to your dream. Grace is prioritizing your self-care no matter what because you know it is NOT your purpose to “succeed” while leaving yourself in shambles. Grace is recognizing what God has already given you and using that to make your dreams come true. Grind says other people have all the answers. Grace says the answers are inside of yourself. Grind is doing it all. Grace is doing only what you were meant to do. Which one are you operating in? 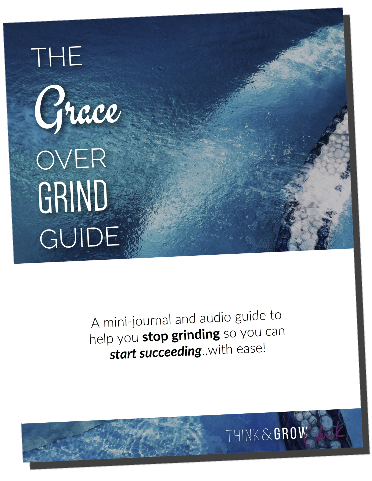 This post ended up being so popular that I decided to create a free journal and audio guide book to help you on your #graceovergrind journey! It’s called the Grace Over Grind Guide and it includes 11 pages of journal prompts and affirmations to help you craft your own grace-filled journey to success. It also comes with a 20 minute audio where I personally walk your through each exercise.